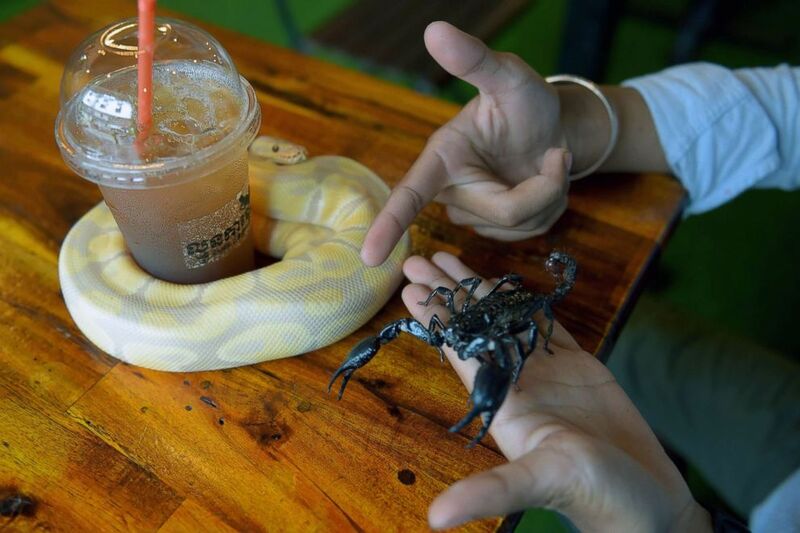 At Reptile Coffee, you can hang with exotic animals while drinking a cup of Joe. Chea Raty loves watching animals on television. During his free time, he watches the National Geographic channel, where he sees all sorts of animals that he's never seen in real life, in his home country of Cambodia. Chea, 32, has always wanted to see the animals on TV in real life, but he never thought it would be possible. That is, until three years ago, when he found some iguanas being sold on the Cambodia-Thailand border. Without hesitation, he spent $160 for a pair of iguanas — one male and one female — and brought them to his home in Phnom Penh. To him the animals were exotic. (Tang Chhin/AFP/Getty Images) A customer holds corpion and a ball python at the Reptile Cafe in Phnom Penh, Cambodia, Aug. 18, 2018. Chea didn't stop at the iguanas, though. Every time he went to the border after that first time, he would buy more animals — mostly reptiles and insects — that aren't native to Cambodia, including an albino python, an orange corn snake, a gecko, a scorpion from Malaysia, tarantulas and turtles. "I have about 20 kinds of them," Chea told ABC News in a phone interview. “It’s exotic, and that's what I want. I want to do something that’s different from others." (Tang Chhin/AFP/Getty Images) A customer hold a tortoise and a green iguana at the Reptile Cafe in Phnom Penh, Cambodia, Aug. 18, 2018. But with more animals being added to the list regularly, Chea had to make sure that he was allowed to keep the animals. So with persmission from Cambodia's Ministry of Agriculture, Forestry and Fisheries, he opened up a coffee shop in March where the animals could hang out. 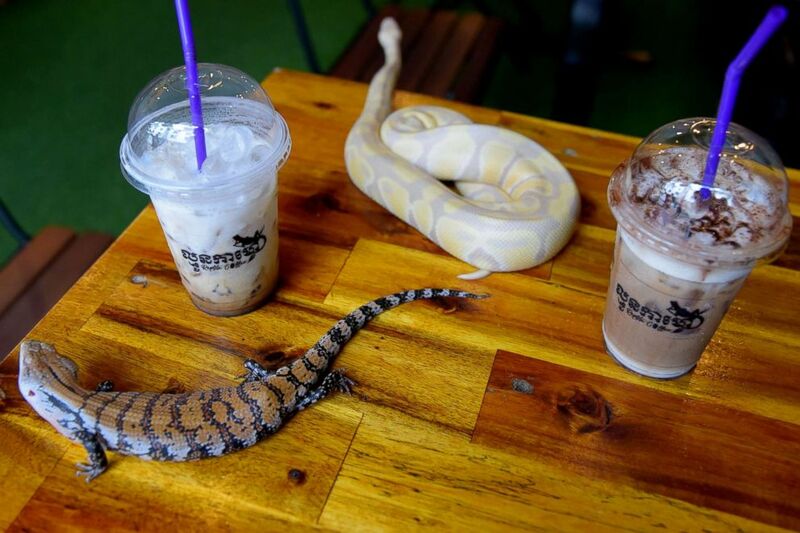 When customers first started going to his coffee shop, called Reptile Coffee, they were scared. However, Chea used their fears as an educational opportunity, teaching them where the animals came from and what their diets were like. 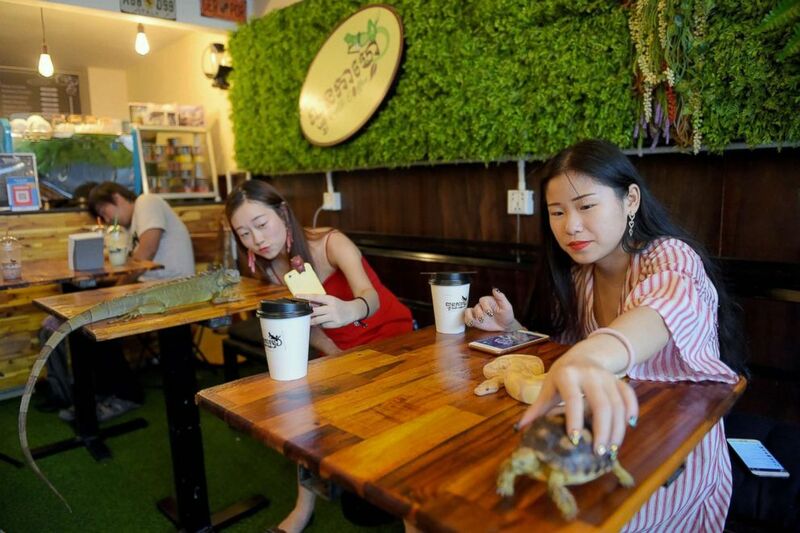 (Tang Chhin/AFP/Getty Images) A reptile and drinks at the Reptile Cafe in Phnom Penh, Cambodia, Aug. 18, 2018. “The scorpion is native to Malaysia so it is tamed to live with people. It doesn’t stink, and its venom is very weak. Customers like to take selfies with them, and I allow them to do that," he said, noting that customers can hold the animal in the palm of their hands. Chea said that it was free to see the animals, and coffee only costs about a dollar. “[People] come for both. First, they love the coffee, so they come to have coffee here. Second, they can also see these animals, which they could only see on TV,” he said. Of course, Chea's primary concern is the welfare of the animals, which he says are getting used to humans. He tells all his customers to be gentle. Chea doesn't seem to have any plans of stopping. His collection of animals is even set to grow, he told ABC News, with the pair of iguanas that first started his collection already producing 20 offspring this year.